What is First Aid For You? 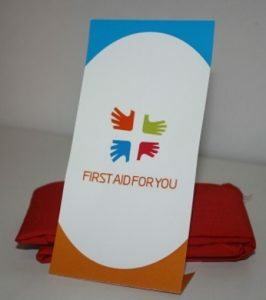 First Aid For You is excited to be launching our HELP Hanky, also known as the ‘Little Red Bandage’. Being in pain for a cut or a sting is hard enough on our precious children, let alone having to cope with the ordeal of blood! The Little Red Bandage was created especially to ‘cover up’ the site of blood as much as possible, to reassure your loved ones. Keep one in your car, the first aid kit, your kids' backpack and even the baby bag! You never know when this neat little bandage will come in handy. Bandages are handmade in Australia from washable cotton fabric and measurements are 90cm x 70cm – ideal for babies and children. HELP Hankies can be purchased for $5.99 (including postage, handling & GST) by completing the form to the right ⇒, emailing us at info@firstaidforyou.com.au or phoning 1300 050 853. Postage, Handling & GST included in all prices. Please list all required items with quanities for your First Aid Kit below. Use our Kit Contents list for reference.